Do you want to batch convert excel to jpg, save excel as jpg ? Do you want to convert specific sheet ranges of Excel documents to images in order to use them in a presentation or elsewhere ? Then try Convert Excel to Images 4dots which can easily convert excel to jpg and you will be able to set also sheet number and sheet area ranges to convert excel to jpg. You can also easily set output filename pattern and output image format. You can also add folders of documents and also import list files of documents. Convert Excel to Images 4dots was added by fourdots_software in Nov 2018 and the latest update was made in Nov 2018. The list of alternatives was updated Nov 2018 There is a history of all activites on Convert Excel to Images 4dots in our Activity Log. It's possible to update the information on Convert Excel to Images 4dots or report it as discontinued, duplicated or spam. Easily automate the ability to extract, save, delete, import and embed images in bulk into Excel with just a few clicks. With Excel Image Assistant you can easily insert picture into Excel cell or comment, one by one or you can insert multiple pictures at once. We want more alternatives to Convert Excel to Images 4dots. Feel free to add any alternative that you know of, or ask your friends on Twitter or Facebook if they can help out. 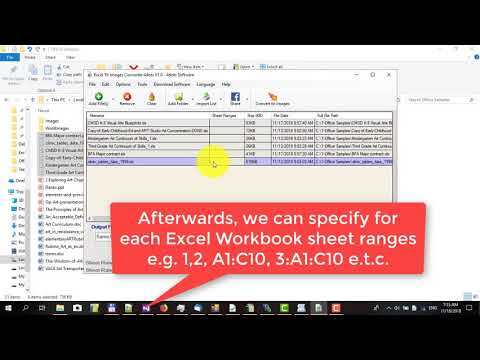 Alternatives to Convert Excel to Images 4dots for Windows, Microsoft Office Excel, Mac, Software as a Service (SaaS), Linux and more. Filter by license to discover only free or Open Source alternatives. This list contains a total of apps similar to Convert Excel to Images 4dots. No reviews yet for Convert Excel to Images 4dots, want to be first? Maybe you want to be the first to submit a comment about Convert Excel to Images 4dots? Just click the button up to your right!